One of the best kept secrets in the service industry is mobile appointment booking. Why? 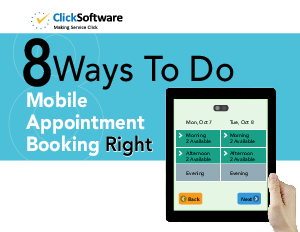 While customers love making their own appointments, mobile appointment booking is also a behind-the-scenes game changer for successful service operations. In this eBook, we let you in on the secrets of industry best practices for mobile appointment booking. Download to learn how with a few simple guidelines, you will be able to deploy a quality appointment booking solution that will give the best customer experience possible, while considering all the sensitive issues around a profitable operation.